Milo ... I loved drinking Milo when I was a kid and my late mom used to tell us that "Milo is an expensive powder imported from overseas" ... hee ... hee ! But as I grew older and into adulthood, .... I don't really fancy Milo anymore as preferred coffee/tea for my beverages. But my kids love the ice Milo ... the ones from McDonald's that comes with a kid's meal. I've not used Milo in cooking, baking or making dessert ... but I think it should taste good if add some Milo in pancakes or crêpe etc. 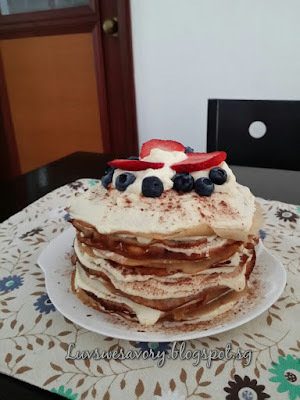 So here's sharing my first attempt in making Mille Crêpe ...or rather Milo Mille Crêpe Cake. Indeed this chilled cake tasted deliciously good ... yummy ! Below my slightly modified version, adjusted the quantities of ingredients and replaced the cocoa powder with Milo. 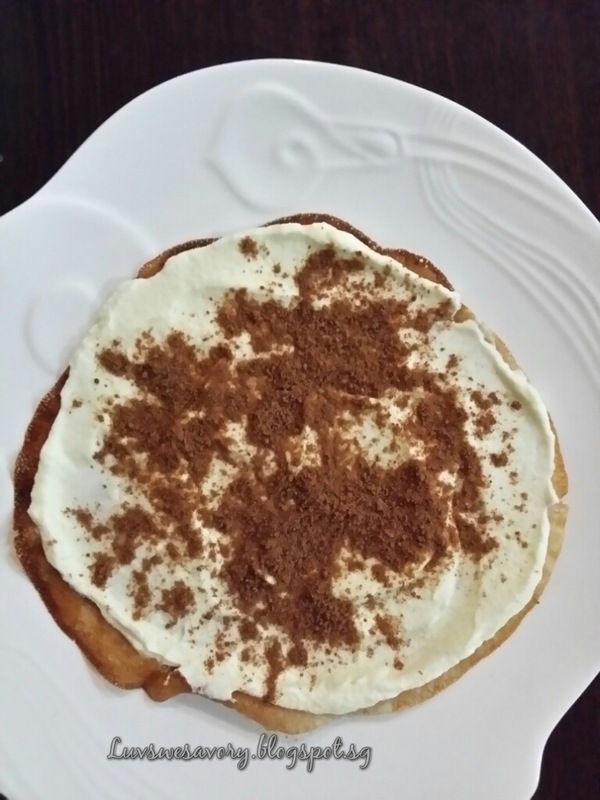 Sprinkle some Milo on each Crêpe with whipped cream. 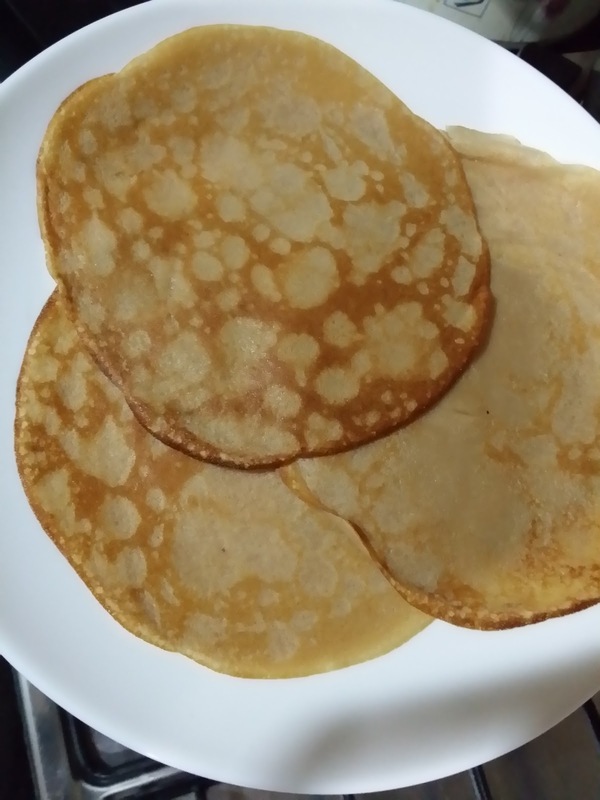 About 100g to 140g of Milo to sprinkle on Crêpe (adjust the amount to your preference). 3) Add in (A) to (B) mixture and whisk till a smooth batter. 4) Heat the non-stick griddle or pan with low flame. Grease with a little cooking oil. 5) Pour crêpe batter using a small soup ladle or ice-cream scoop, swirl to cover the surface of the pan. Cook about 1 minute. Using a chopstick to tip the side, with your fingers, gently and carefully flip the crêpe over, continue to cook for about 30 seconds. Freeze the cleaned mixing bowl for about 10 minutes. Take it out from the freezer, immediately put all together the cold whipped cream and caster sugar in the cold mixing bowl. Use the electronic mixer to whisk till stiff peaks form (about 4 - 5 minutes). Sprinkle some Milo powder (about 1 tablespoon) on each crêpe spread with whipped cream. Next, top with another crêpe and repeat the same process till finished the filling. Decorate the top with some berries and dust a little Milo. Refrigerate the cake for more than 10 hours or overnight before serving. Have a sweet week ahead ! OOOOhhhh...I love mille crepes. Add milo to it...heaven!! Yes, agree ! I've fallen in love with mille crepes too ^-^! I don't know why you said that your Milo mille crepe is not graceful!!! I think the layering bit of your cake looks awesome! This kind of Milo overloading... I want! Thanks Zoe. Thanks for the kind words and encouragement. Wonderful! I made one that is very similar a year ago! Very time consuming but so worth the effort! Hi Sharon, thanks for dropping by. Hi Karen, This is good! The layering is so neat. I'll try out your recipe this weekend! Thanks, I hope my next mille crepe cake will look better and neater ... hee ... hee ! 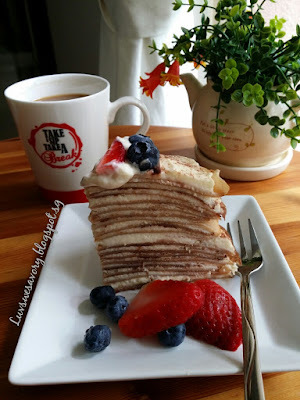 Hope you give it a try too as we find this Milo crepe cake tasted very good. Ha ha ... think my girl and I are in a "dilemma" ... on one hand want to loose some weight but on the other hand craving more for these yummy "fattening" desserts/cakes .. aiyoh ! 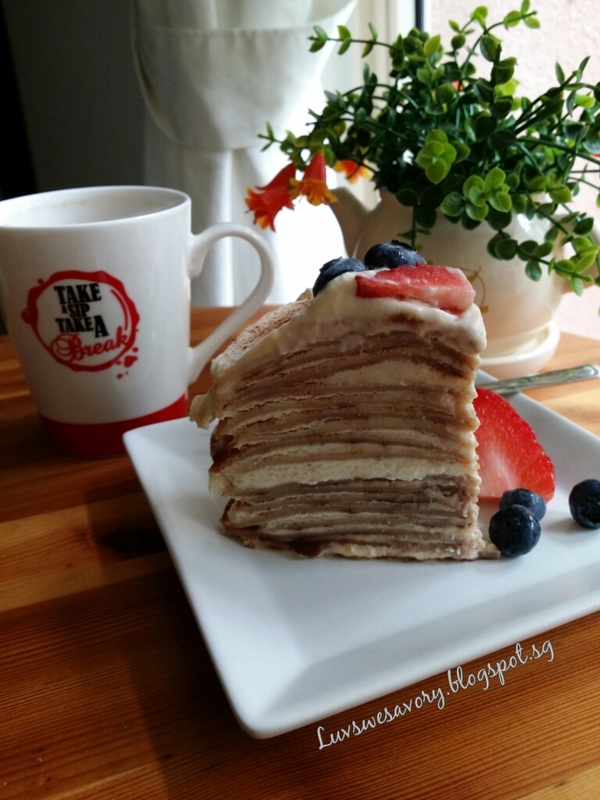 Hi Karen, your crepe cake is beautiful, love everything about it!!! Thanks for the compliment Cheri ^-^ ! 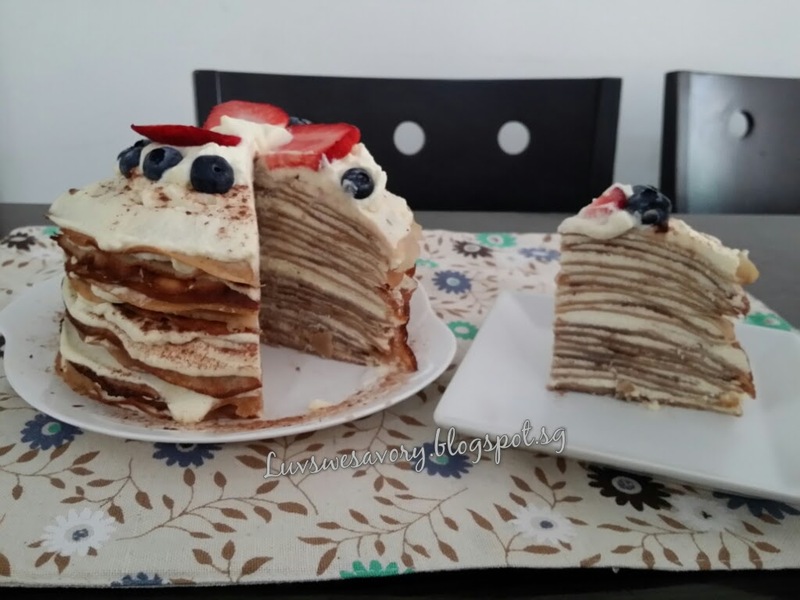 hey karen, your milo crepe cake looks awesome la! i wanted to make crepe cakes from eugenie kitchen too...but you know , i'm very slow...milo is my fav beverage! Hi, your Milo crepe looks lovely, especially the layering! This looks sooooooooo goooooood Karen! Yeah, it tasted good too, thanks Joyce! wow........mille crepes ! I try to count : 1,2,3,...................16,17and 18 layers you have done . Awesome ! 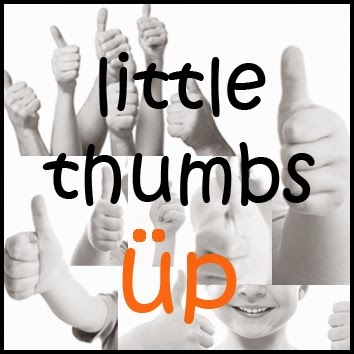 Thumbs up for you, Karen. Hee .. hee.. I lost count ... Thanks Aunty Young ^-^! I love your rustic looking mille crepe. It is simply wonderful! Yours are loaded with milo powder, I want some too.